"I don't know if this is similar to the loosemeat sandwiches served at 'Roseanne's diner', but it's worth a try." In a large skillet over medium heat, saute garlic in oil until it begins to brown. Add onion and saute until soft. Add beef and saute, stirring constantly with a fork to crumble as finely as possible. When meat is browned, add the tomato juice, brown sugar, Worcestershire sauce, seasoned salt, browning sauce and cayenne pepper. Stir together and let simmer uncovered, stirring occasionally, until the liquids have evaporated (about 15 to 20 minutes). Spoon mixture onto hamburger buns and serve. 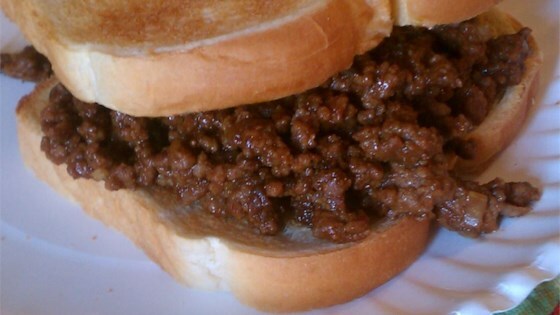 I really like this, I grew up on sloppy Joe's, this is a grown up version. I served it on Potato rolls with corn and french fries. will add this to meal rotation! This recipe was good. We tried it with rice also but what my family actually preferred was putting the meat in a tortilla with refried beans & sour cream. very yummy. my kids and husband loved it. next time i will make a double batch. Was a good quick meal for a week night. I don't think I will be making it very often though. There was just something a little off about it but I couldn't pinpoint it.